Ken Ramsay from Fraserburgh. Picture by Kenny Elrick. A bus passenger has claimed the Buchan Xpress should be renamed as it is too slow – and say it is now even longer despite the new A90 opening. 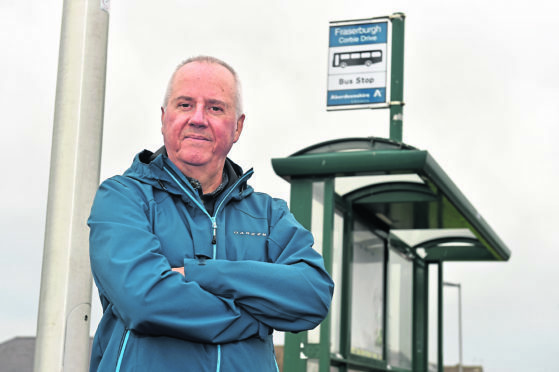 Retired teacher Ken Ramsay uses the 67 or 68 bus from Fraserburgh to Aberdeen about three times a week, and claims the Buchan Xpress name is “false advertising”. He has timed the 40-mile journey, and claims it takes an hour and 45 minutes on average – causing misery for him and his fellow passengers. Mr Ramsay believes the service now takes longer than it used to despite the Balmedie to to Tipperty stretch of the AWPR opening last month, as the bus still uses the old route. The service has added additional stops in Balmedie, further increasing journey time. Last night, Stagecoach North Scotland said a consultation was currently being carried out as part of a review of Aberdeenshire’s services, with an updated timetable due in November. Mr Ramsay said: “This is not merely our connection to Aberdeen, it is our route to the outer world, for connections to trains, boats and planes. “For a distance of 40 miles, this means that the Xpress is averaging just over 20mph, so clearly the word express needs to be dropped as it is plainly false advertising. “Despite the new road, the Fraserburgh bus is now going through Balmedie and along the old road which still has roadworks. “Its not gone through Balmedie in about 10 years – why on earth would is it now going through there when they are serviced by other buses? “People were hoping for a swifter journey time and it is actually slower. Mr Ramsay has written to Stagecoach, suggesting a change of services to improve the journey times after having “plenty of thinking time on the bus”. Banff and Buchan MP David Duguid said: “Many people in Fraserburgh, and indeed across my constituency, rely on the bus network to get around. “I can understand the frustration with the amount of time it can take to arrive in Aberdeen – it is a long enough journey without any added stops. A spokeswoman for Stagecoach North Scotland confirmed the company is currently holding a public timetable consultation. She said: “Our Buchan Xpress network is included in this consultation and from November 12 we hope the service will benefit from quicker journey times due to the infrastructure improvements in the area. “Our services in Buchan serve a range of towns, to compare journey times directly to a car that does not stop to pick up and drop off passengers is wholly unrealistic. “At peak times the service takes approximately 90 minutes to travel from Fraserburgh to the city centre of Aberdeen.